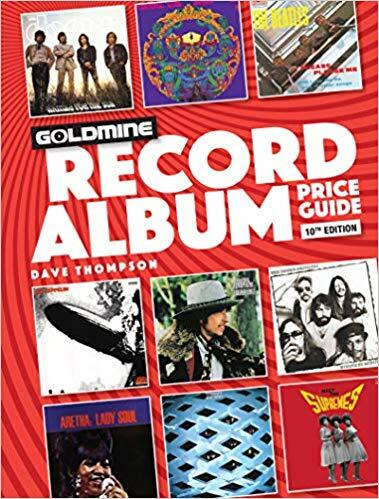 With over 110,000 albums listed, the Goldmine Record Album Price Guide is the most comprehensive listing on the market. This guide lists all albums that are worth at least $15 in near mint condition. In addition, it lists promo and dj copies when available. There is a section describing how to determine the condition of an album. This book includes very clear descriptions of how to tell the $250 copy from the $15 copy using color or changes in the album photo in addition to the catalog number. There are rock, folk, pop, jazz, country, soundtracks, and compilation albums included. Despite being 800 pages in length, it is very easy to find a particular album as they are alphabetized by artist or group name. It is interesting to go through and see how much the albums from your youth are worth now. For example, Prince is worth more than both Madonna and Michael Jackson. Most of the pop and rock albums are only worth $15, which with inflation is probably what you paid for them. Not only that but trying to reach the near mint condition required to get the $15 basically means that you can’t have played the record much as even bent corners on the sleeve will downgrade the album. It appears that you will have better luck searching for 1960s jazz albums in thrift stores or pawn shops if you are hoping to find a profitable album. My only complaint is that I would like to see more pictures of the album covers in the listings. At most there are only a few per page. But that is a minor complaint. Overall, if you are interested in albums from the 1950s through the 1990s, the Goldmine Record Album Price Guide is the best choice out there. 4 stars! Thanks to Krause Publications and NetGalley for a copy in exchange for my honest review.